Ensure that your style is unmistakable with the help of this funky and alternative Marvel Deadpool Target Practice T Shirt in Black! Aim to strike in true fashionable style with the help from this super funky tee! If you love all things Deadpool and Marvel, then this is the crew neck tee for you! Boasting a large sketch effect target practice design, this black tee is sure to get people talking! Paired perfectly with a simple pair of skinny jeans and trainers, this top is sure to set your style alight! So, what are you waiting for? 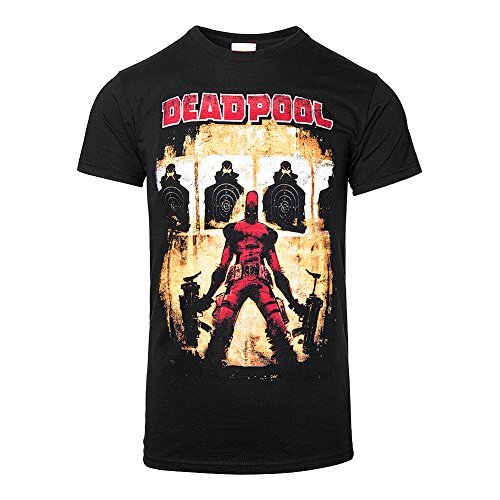 Unleash your inner superhero with the Marvel Deadpool Target Practice T Shirt!